Shoei have really done their best to corner the touring market with the Neotec 2 and GT Air 2. These 2 helmets are going to be top of the range in modular and the full face categories. Plus they even come with pretty similar features. Just sitting them together makes it difficult to see which one is which, though I should make it clear that the Shoei GT Air 2 is a full face helmet and the Neotec 2 is a modular helmet, which opens like this. I’m going to show you what is different between these helmets but first, there are a lot of similarities. The shell is made of the same AIM material and is available in 3 sizes for each helmet. They both have a steel micro ratchet enclosure system, a similar liner and visor mechanism. Even the differences aren’t that different between these helmets though. Moving onto the ventilation, the chin vents look different but function pretty much the same. The top vent is the same story but the exhaust vents are quite different. The GT Air has 2 vents coming out of these ridges while the Neotec has vents under the wing. Functionally, these are pretty similar, though the GT Air has a little more sleek and sporty design with the large wing at the back. When it comes the visors, they are similar though the Neotec uses the CNS 3 visor and the GT Air uses the CNS 1. There are some minor differences but overall they just fit onto the different mechanisms. Even the mechanisms themselves are pretty similar though. Both have a cracked city position and a very strong seal against the shell. The drop down sunvisor on the GT Air 2 can be adjusted with these notches between the shell and the liner though, which the Neotec 2 lacks. On the inside, the helmets are also almost the same. The EPS looks almost identical though the ventilation holes in the EPS are slightly different. The end result is pretty similar though. One nice difference is that the GT Air 2 does come with an emergency quick release system for the cheek pads but the Neotec 2 does not. It is a nice to have feature on the GT Air 2. Both helmets are prepared for a Sena SLR system, though the GT Air is prepared for the SLR 2 and the Neotec for the SLR 1. The SLR 2 mic will be placed in the shell of the helmet and the original SLR system had a mic which stuck out, near your mouth. This is because the Neotec is a modular helmet and the mic had to be independent from the chin bar, otherwise you would end up pulling your wires out whenever you lifted up the chin bar, or you wouldn’t be able to speak into the com system with the chin bar up, which does kind of defeat the purpose of a com system. In terms of weight, the GT Air is lighter because it is a full face helmet. It weighs in at 1450 grams and the Neotec weighs 1650. So there is a 200 gram difference between these helmets. Both of these helmets are size M’s as well. In terms of noise isolation, we did test both helmets and the results were pretty interesting. The Neotec 2 scored 27 against a control of 13, meaning that it blocked about 14 decibels of sound. The GT Air 2 scored 23 against a control of 18 though. So it only blocked about 5 decibels. The Neotec scored amazingly well, while the GT Air scored about average for what we normally see. Both block wind noise pretty well, though the GT Air is slightly stronger in this area. 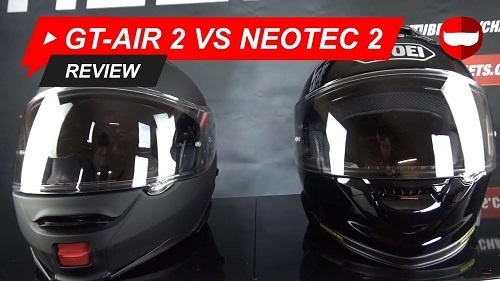 Alright guys, this pretty much everything that you need to know when comparing the Shoei Neotec 2 and the Shoei GT Air 2. I hope that you found it useful and thanks for reading.